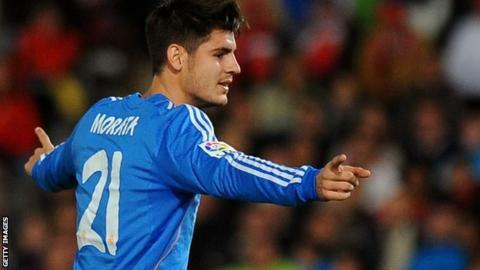 Real Madrid striker Alvaro Morata wants to remain with the Spanish club after being linked with a move to Arsenal. Reports have suggested that the 21-year-old would join the Gunners on a six-month loan deal in January. Morata told the club website: "I feel the boss trusts me, so do the coaches. I want to be here for a long time." Boss Carlo Ancelotti said: "Morata stays. He is happy. If he doesn't feel comfortable at the end of the season we will think about loaning him." Morata added: "The manager has played me in a lot of difficult matches and I am very happy. I have to repay his trust in me." Spain Under-21 international Morata is highly rated in his homeland and has scored two goals in 12 appearances this season, albeit 11 of them as substitute. Real Madrid visit third tier side Olimpic de Xativa in the Copa del Rey on Saturday. Read more on Barcelona v Real Madrid: New faces set to spice up El Clasico?